Be the One to Grow Your Village! The Artists Guild of Manatee is proud to announce participation in the 2018 Community Foundation of Sarasota County’s Giving Challenge, a 24-hour online giving event from noon on May 1 until noon on May 2. This year we are hoping you can “Be the One” that helps The Artists Guild of Manatee continue the progress in Village of the Arts by making a donation during the Giving Partner Challenge. The Patterson Foundation is providing support again this year by a generous 1:1 match for all unique gifts up to $100 per donor. How will your donation help the Artists Guild of Manatee? 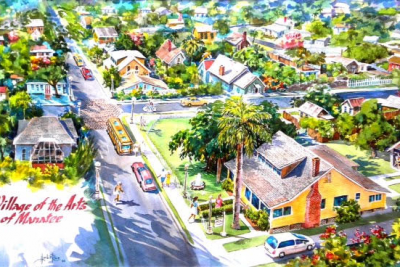 The Artists Guild of Manatee will use Giving Challenge funds to grow your village through the following projects. Turn the Village into a pollinator sanctuary! 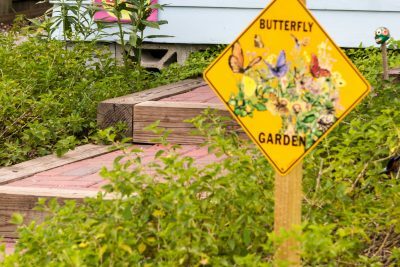 This program will help establish pollinator gardens throughout the Village of the Arts that support local birds, bees, butterflies, and other pollinator wildlife. Share the process of art with the community! 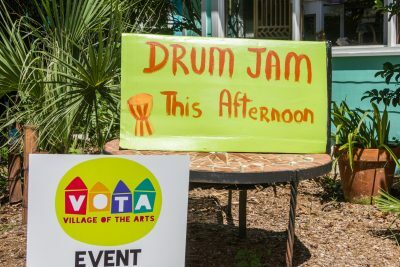 This program will establish art programming to engage Village artists with the community in creative projects. Preserve the rich historical record of the Village of the Arts! This project will creatively document the history of the Village of the Arts through a piece of community art. What is the Giving Challenge? The Giving Challenge is an incredible 1-day fundraising event that supports over 600 non-profit organizations serving Sarasota, Manatee, Charlotte and DeSoto counties. It’s one of our biggest opportunities to raise funds for creative projects & neighborhood beautification in the Village. The “Be the One” theme of the 2018 Giving Challenge is inspired by the Community Foundation of Sarasota County’s belief that each one of us has the potential to impact a person, a cause, a community. The philosophy sprouts from the idea that each donor can #BeTheOne to make a positive, lasting difference. The Giving Challenge encourages us to support the local nonprofits doing excellent work right here in our backyard! The Giving Challenge will only be open for 24 hours! Beginning at noon on May 1, www.GivingPartnerChallenge.org will go live and you can search for The Artists Guild of Manatee and make a 100% tax-deductible donation. The minimum donation accepted is $25. Major credit and debit cards will be accepted. Only online donations will be contributed to The Giving Challenge total. After your donation is made, you will immediately receive a tax receipt to the email address you provide. To strengthen giving during the 2018 Giving Challenge, The Patterson Foundation will provide a 1:1 match for all unique donations, up to $100 per donor, per organization. There is no limit to the number of individual matches from unique donors a nonprofit can receive during the 2018 Giving Challenge. Your gift will make a huge impact to supporting Artists Guild of Manatee programming designed to nurture the growth of the Village of the Arts. Thank you to the 2018 Giving Challenge Foundation Partners! The Giving Challenge is made possible through the Community Foundation of Sarasota County, The Patterson Foundation, Manatee Community Foundation, John S. and James L. Knight Foundation, and the William G. and Marie Selby Foundation.